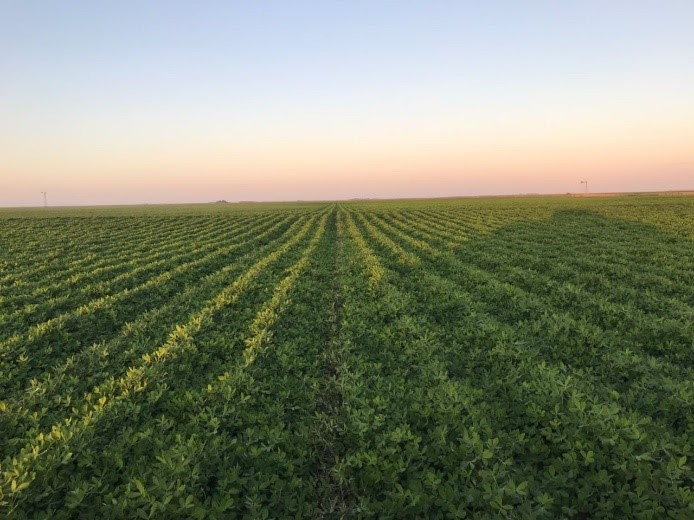 In general terms, peanuts have not improved their status compared to the situation reported in January 2018. 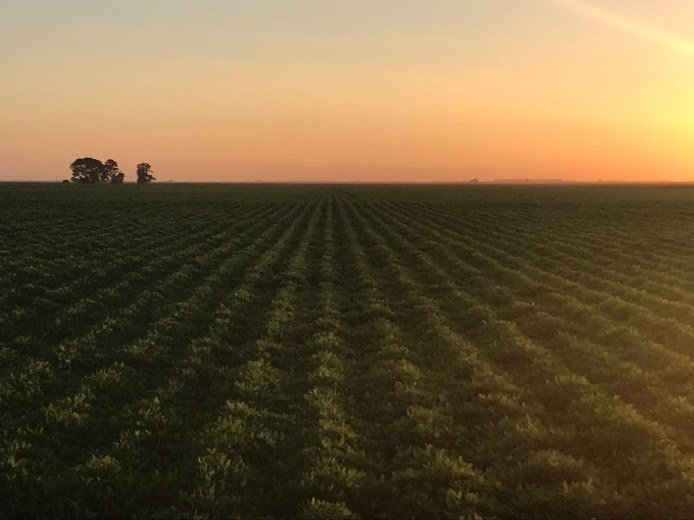 Throughout the previous month, rains were insufficient and temperatures were extremely high, which resulted in the crop stalling its vegetative growth. As we are approaching a critical stage of the crop development, rains are urgently needed to revert the extreme drought situation faced by most peanut areas. Soil moisture may reach its maximum retention capacity or field capacity, by which plants extract water without difficulty; on the other hand, it may reach values below the permanent wilting point, at which a plant would wilt to a point of no recovery. Between field capacity and the permanent wilting point stands the range that we designate Useful Water. As useful water is consumed, and reserves come close to the permanent wilting point, the effort of the plant to extract water is increasingly greater. As mentioned above, January featured rainfall below the historical averages in almost all the peanut-growing areas. Differences have been noticed with respect to previous years regarding the intensity and magnitude of winds, consecutive days with high temperatures (>37 ºC) and heat waves, understood as long time periods with daytime and nighttime highs. January featured average lows at 20 °C, while highs ranged between 34 °C and 38 °C. (Source: INTA General Cabrera). Such extreme peaks in air temperature records range within a historical average, but that is not the case for the consecutive days under the same condition. Hence, we assume this is an exceptional phenomenon. 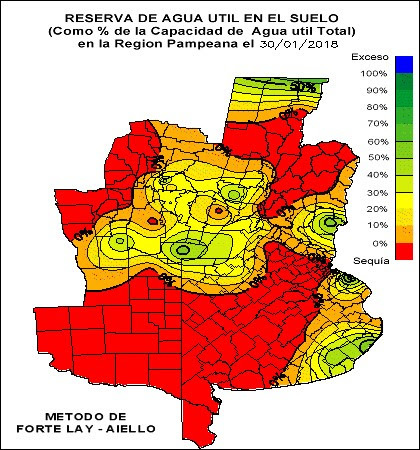 After weekly visits to all the areas, we may confirm that presently, the overall peanut-growing area encompassed by the Northern, Central, and part of the Southern area, features soil in extreme drought condition, which implies that abundant rainfall is required urgently. 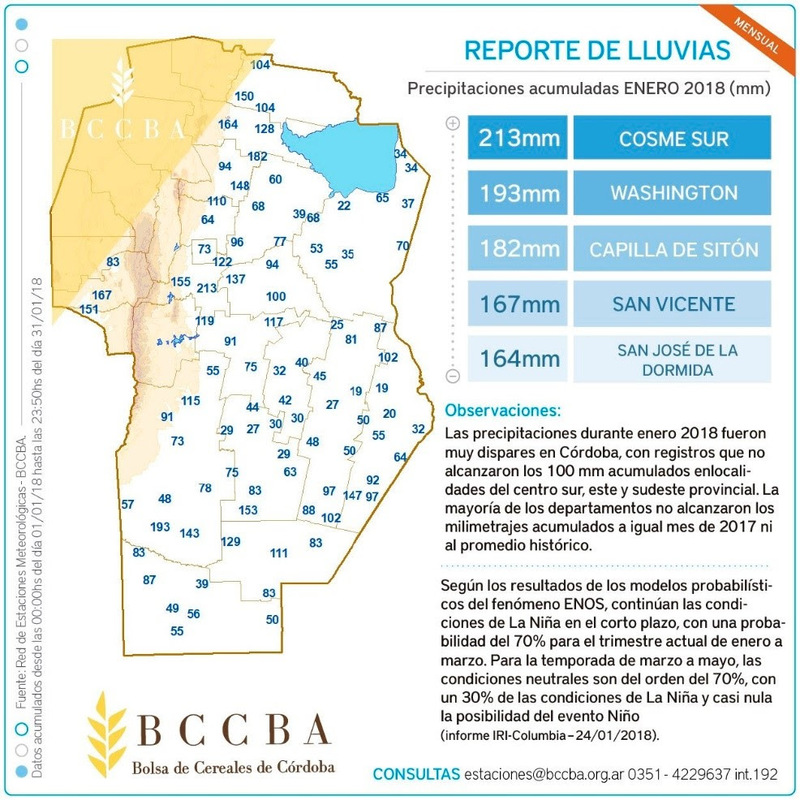 The Western Area (Province of San Luis) had scattered rainfall of low magnitude but useful to help the crop sustain field conditions. Anyhow, the crop is undergoing the stage of highest water and nutrient demand and new rainfall is required to complete soil profiles. This condition of thermal and hydric stress is chiefly due to the high hydric demands of the crops arising from the good vegetative development they have attained and that they are in the full peg, beginning pod and full pod stages. 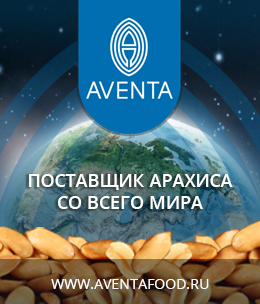 Overall, at present, most peanut crops are in the most critical and decisive stage thatdefines future yields. Northern Area: phenological growth stage is R2. 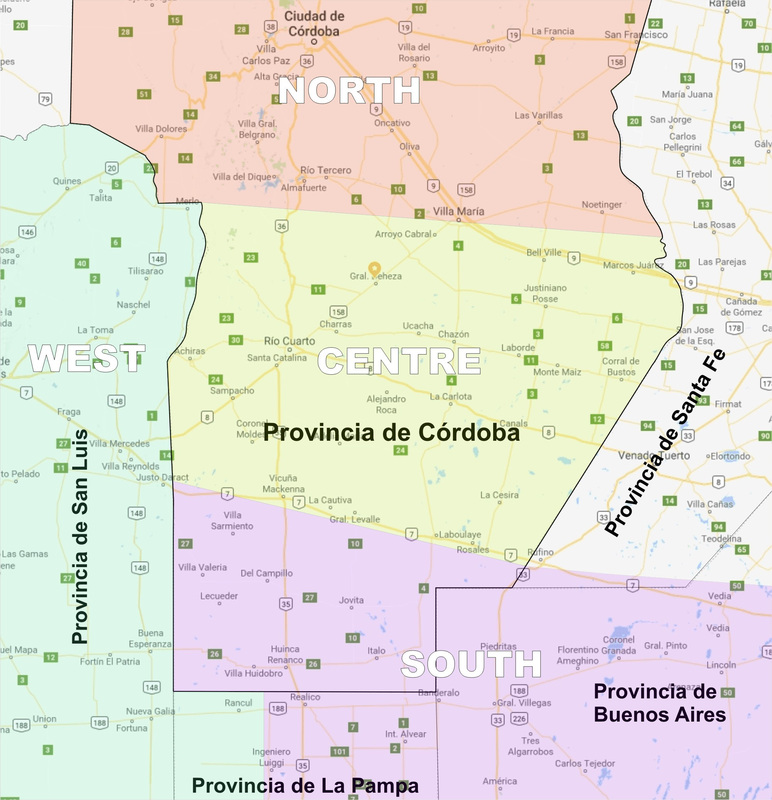 Central Area: evolution is at R3-R4. Southern Area: phenological growth stage is R3-R4. 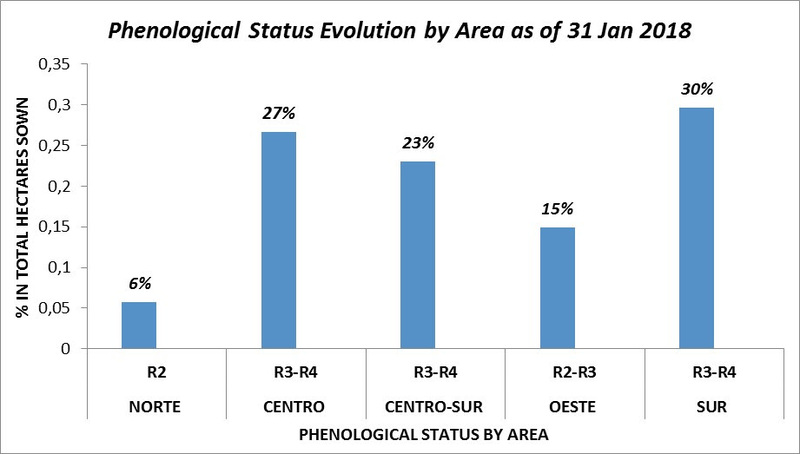 Finally, for the Western Area, the phenological growth stage is R2. Overall, the peanut crop is presently undergoing an active vegetative and reproductive growth stage. Herbicide treatments are continued to control weeds across all the areas on our reference map. Farmers from all the areas on our reference map are planning second fungicide applications to prevent leaf disease (Peanut leaf-spot) in the lots planted in the early days of October, while the first application is planned for the lots planted towards the end of November. As a result of the seasonal drought in several areas, the red spider mite has been detected in lots. Measures are being adopted to control this mite given the irreparable damage it inflicts on the crop. Monitoring has been reinforced for this purpose. Among the issues to be addressed is the presence of Gramineae and broadleaf weed likeAmaranthus spp, Conyza spp and Ipomoea that require post-emergence herbicide applications. Although residual herbicides have been used, scarce rainfall after application impaired the efficacy levels obtained in previous seasons. Presently, leaf diseases are managed successfully, but fungicide rotation will be of utmost importance to prevent resistance. 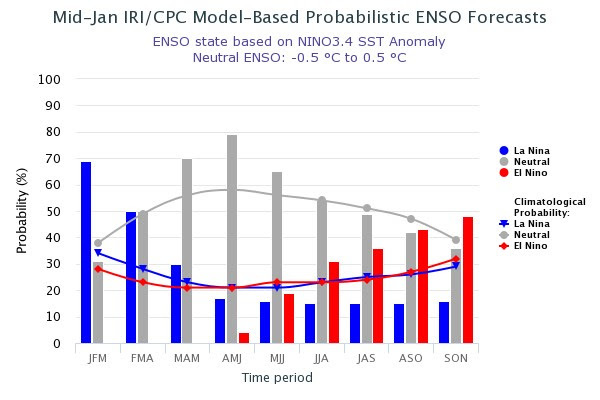 The following chart depicts the likelihood of every event according to ENSO. In January 2018, the occurrence of La Niña is more evident, it subsides in February but it is still pervasive. In March, a Neutral year becomes visible and La Niña is no longer present. March, April and May are in line with a Neutral year model. All this would indicate that, if the ENSO simulation model is fulfilled, the peanut crop will evolve without relevant climatic issues like the ones we have suffered in the last two years. It is important to remember that the conditions of a Niña year remain highly effective, chiefly evidenced in the course of January, in line with forecasts in previous reports. To date, we may assert that peanuts did not improve their condition based on our previous report. 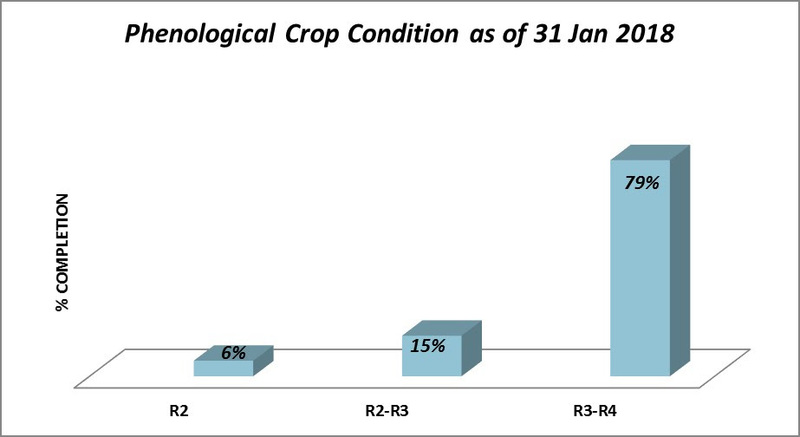 In January, insufficient rainfall in line with high temperatures resulted in the crop stalling their vegetative growth and entering a latency period, except for the Southern Area, which benefited the most from rains. 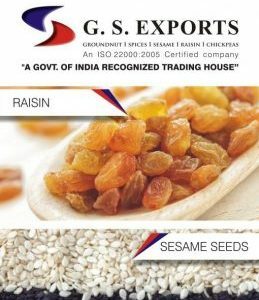 We are suffering extensive drought in almost all areas and the crop demands more water than what it is capable of holding as reserve, by which rains are urgently needed. At this point we are going through the most decisive stage for the crop (Beginning pod), which implies high nutritional and climatic demands (Normal temperatures and timely rainfall). Consequently, weather evolution in the forthcoming 35 days is crucial to obtain quality peanuts and high yields.